We are excited for you to meet Kayla! She is the new addition to the ServiceMaster by Ayotte team. Kayla grew up in Faribault, MN and recently got engaged! She isn't afraid of hard work and is eager to jump in with both feet. In her free time Kayla enjoys spending time with friends and family. She also really enjoys softball - you can typically find her either out on the field playing the game, or on the benches cheering on her fiance! What is your role within ServiceMaster by Ayotte? "I am the Administrative Assistant here at ServiceMaster by Ayotte!" What got you started in this industry? "I have worked in a few different industries, but nothing like this. I really enjoy being able to do all sorts of different things, but knowing that I am still getting jobs done and that is what this business is all about! Each day is different, and we handle different situations daily. I have experienced a few different kinds of work but nothing ever like this. I like to be able to do different things but knowing that I’m still getting jobs done and that’s what this business is all about. We handle different situations daily." What were you most surprised to learn about when starting out in this industry? 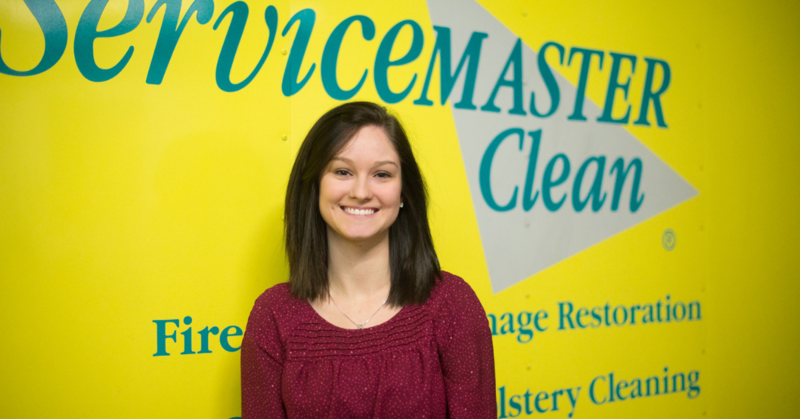 "There are so many things I didn't know ServiceMaster by Ayotte handled until I started here. I only had a broad idea of what they can do - and it is so much more!" "I love learning new things every day and being able to talk to different people. I really enjoy helping them solve the problems they are experiencing." "I have a big heart!"